Tags: Journal, Letitia Suk, who is writing yor story? So what were you doing 30 years ago today? I took my two-year old daughter and her friend to story time at the library, got my six-year-old daughter to the ice skating, a friend stayed for dinner and we all watched the World Series. Riveting, right? Some decades of our lives can just swoop by leaving a handful of memories like a few vacations or special events. Yet we are all writing in the book of life every day. Do you ever ponder where all that time went? Thirty years ago on a nondescript day in October of 1988, I looked around at my four children aged 2-10 and wondered what any of us would remember about these days of playing house for real. So much of our time was all about making lunches, preparing dinner, cleaning up, tossing another load of laundry in and…you know how it goes. 10/18/88 (Saturday) Spent the day doing a marriage conference and Karla took the kids to the Art Institute. Christa was at Cooneys all day. Ordered pizza from Little Caesars and ate it sitting on the floor watching the first game of the World Series. Dodgers vs Oakland A’s. For the past thirty years, I haven’t stopped. Each morning in around 100 seconds I can record the happenings of the previous day in about three lines. Most days are just not that sensational! The notes are all about the facts, what happened. 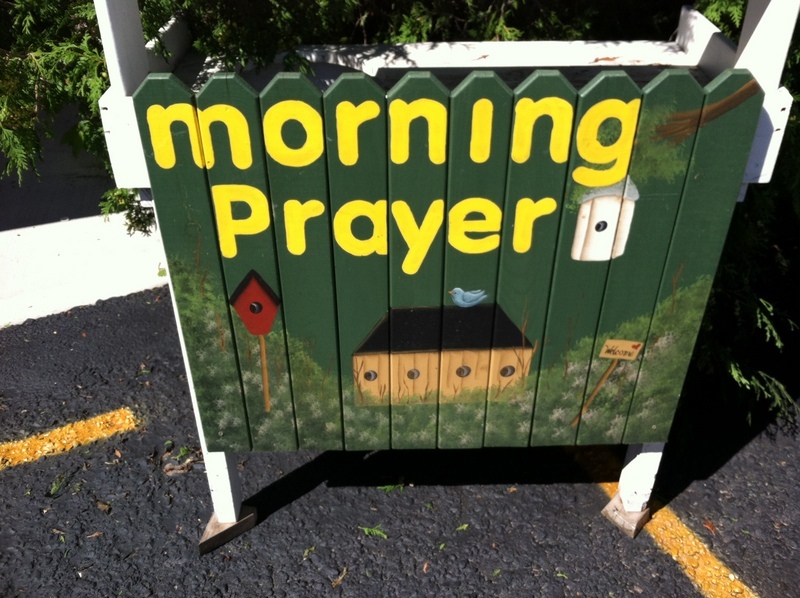 I save my emotion for my prayer journal. Can you tell I like to write? Funny but the journals, I’m on # 29, now, have evolved into our family’s Google system. 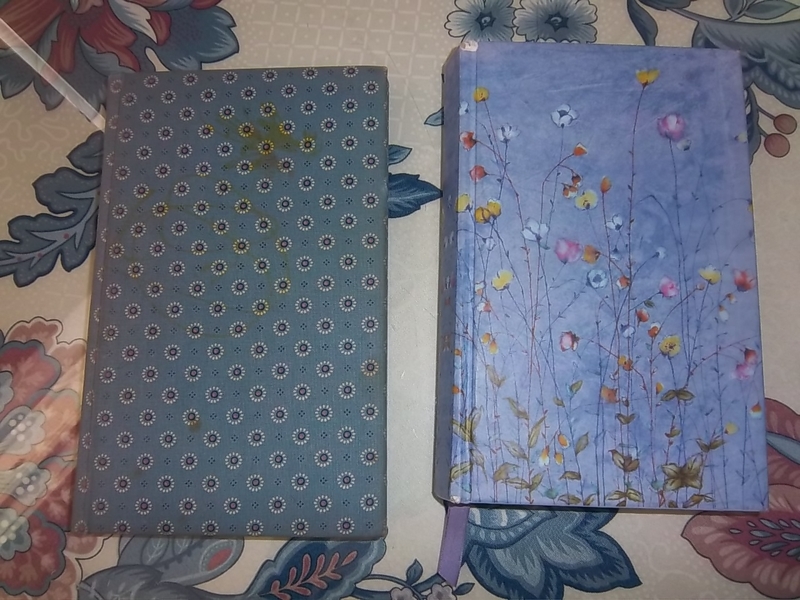 Questions like “Who did I go to prom with junior year?” “When did I get braces?” “Where did we go on vacation in 1993?” are all answered in the journals. I hope to keep this up, for let’s say another 30 years. Maybe no one will really care that one day we ordered pizza and watched a ball game. Could be said about many days around here! But I care….and that is enough. What is not recorded is not remembered. * Adapted from a previous blog post in 2016. Tags: Journal, who is writing yor story? So what were you doing 28 years ago today? I took my daughter to the bookmobile and we all had an early dinner and watched “Our House.” Exciting, right? Twenty-eight years on a nondescript day in October of 1988, I looked around at my four children aged 2-10 and wondered what any of us would remember about these days of playing house for real. So much of our time was all about making lunches, preparing dinner, cleaning up, tossing another load of laundry in and…you know how it goes. 10/18/88 (Saturday) Spent the day doing a marriage conference and Karla took the kids to the Art Institute. Christa was at Cooneys all day. Ordered pizza from Little Caesars and ate it sitting on the floor watching the 1st game of the World Series. Dodgers vs Oakland A’s. For the past twenty-eight years, I haven’t stopped. Funny but the journals, I’m on # 27 now, have evolved into our family’s Google system. 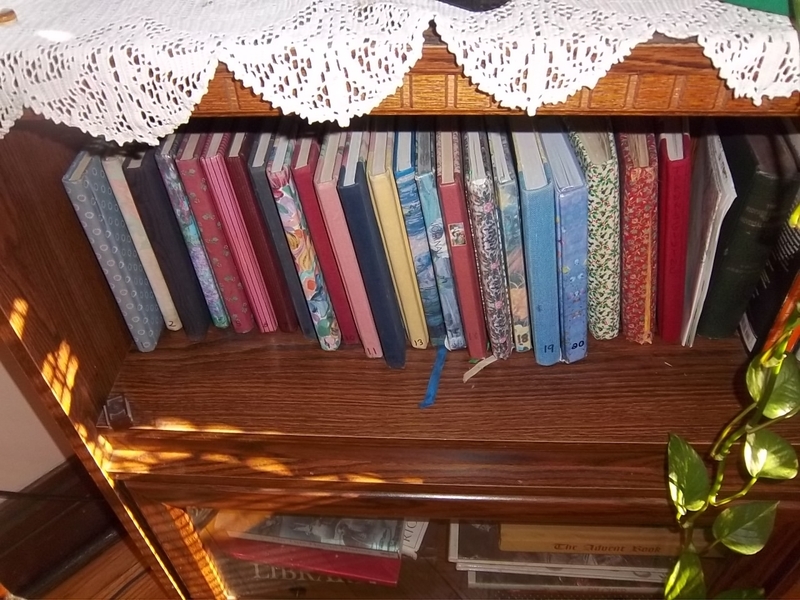 Questions like “Who did I go to prom with junior year?” “When did I get braces?” “Where did we go on vacation in 1993?” are all answered in the journals. I hope to keep this up, for let’s say another 28 years. Maybe no one will really care that one day we ordered pizza and watched a ball game. Could be said about many days around here! But I care….and that is enough. Mug of tea in one hand, English muffin in the other and my basket of assorted reading slung over my arm, I head to the patio these summer mornings. In between greeting the neighbors and their dogs as they walk by my outdoor sanctuary, I pull out the books one by one and set the course of my day. For the first time in many summers, I am not reading a Madeleine L’Engle work of non-fiction but instead, in between journal writing and listening to the audio Bible, I am enjoying three very different genres of books that are not usually on my must-read list. Curious? 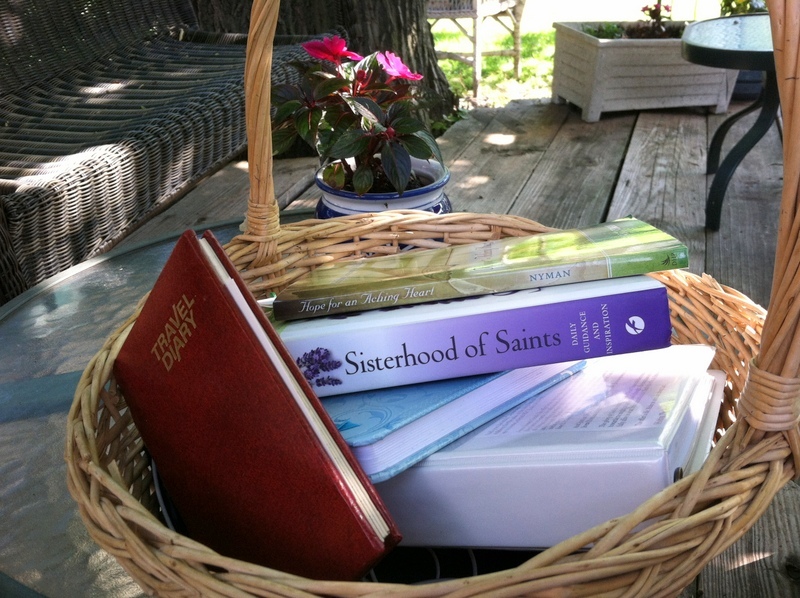 Sisterhood of Saints by my friend, Melanie Rigney. http://amzn.to/1lU9VP3 Although I am not Catholic, I draw inspiration and encouragement from these stories of women of faith in the page-a-day format. Hope for an Aching Heart, written by another friend, Margaret Nyman. http://amzn.to/1xSCTr5 I am also not a widow but walking along side of Margaret in these devotions spun out of her stories of her husband’s death has enriched my faith and empathy for my friends walking this journey. Travel Journal written by me 42 summers ago! I found this slim broken-spine little red journal in the back of the closet with all the other written memorabilia of my life so far. Remember my post The Night I Preached in Rome? This journal provides the rest of the story of that memorable summer in Italy. Each day I read the corresponding entry from the same date. This morning I recounted arriving in Bologna Italy and greeted by pizza and peaches served by a local church! Fascinating to “see” myself in that season of life. Morning books overlaying the journals. What’s on your morning list? Have you ever noticed that when a good idea drops in the best course of action is to act IMMEDIATELY? 24 years ago today I had one such idea. My life was defined by acts of service to my young children…10, 8, 6, 2 years old. Day after day flowed by in what I call the long “blur” season of my life. All of my energies focused on maintaining crowd control and doing the next thing. I loved the sweet time with my precious ones and knew deep foundations were being laid but wondered if any of us would remember any detail from these days. October 15, 1988. A most random nondescript day. Somewhere in the gap between school’s end and dinner’s beginning, the thought danced into my mind to start recording the ordinary beginning with todayinstead of the beginning of the month, next week or whenever. Had I stopped to start one more load of laundry or added another plate to the dishwasher, the idea would have receded for another 6.5 years or so. You know how that goes right? But instead, I herded them all up and into our big van and drove to the closest book store to buy a blank book and began to record the events of each day in a couple of sentences. The first recorded day included brief details of who the kids played with, what we had for dinner…Little Caesar’s Pizza, and what we did in the evening…watched the first game of the World Series, Dodgers vs Oakland A’s. Note…no emotion details, just the facts, M’am. And so it continues, day after day for 24 years. I opened volume 23 this morning to record a few lines about yesterday…Went to church, uploaded photos, dropped off a gift to our granddaughter, made pumpkin soup and watched 60 Minutes and The Amazing Race. The volumes are always accessible unlike my prayer journal and function as our family’s personal Google Search. Who did I go to that dance with? Why did I go to the ER junior year? What year did we go to Aunt Jean’s for Thanksgiving? All the answers and more are in the journals. I do wonder what other ideas got away in that season of life but so glad this one didn’t. Enjoy the Little Things for one day you may look back and realize they were the Big Things. Robert Brault.